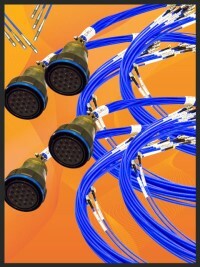 ConductRF's skill in the manufacturing of Phase Matched RF Cable Solutions is second to none. We have phase matched a diverse array of solutions from Low Frequency RG and LMR Cables to more premium exotic cables up to 70 GHz. With a broad base of standard connectors and cables in stock, we turn solutions around fast. D38999 offers users great density for consolidating RF cables in to small package sizes. With many different standard commonly available. ConductRF can offer Phase Matched RF Lines for Customers to self install or have us factory install and enhance with environmental protections. We support the following RF Inserts. We have solutions across all standard industry interfaces all the way to 70 GHz with 1.85 mm Solutions. We support all variants of SMP/SMPM as well as all common standards including SMA, SMB, TNC & Type-N. ConductRF also maintains a diverse array of standard cables from standards like RG and LMR cables to many of our performance cables operating at 18, 27, 40, 50 & 70 GHz. Phase Matched cables are required in many applications and for various reasons. Common application include Phase Arrayed Radar & Broadcasting systems to allow directional focus, but increasingly more multi-channel devices and solutions for detection and communication benefit significant from using Phase Matched solutions.